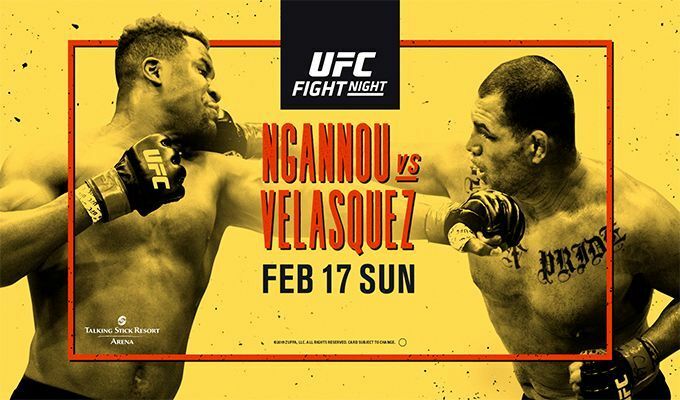 Check out MMA News' live coverage of UFC on ESPN 1, as Francis Ngannou welcomes the returning former heavyweight champion Cain Velasquez. Tonight (Sun. February 17, 2019) the UFC hosted its first-ever event on ESPN. UFC on ESPN 1 took place from the Talking Stick Resort Arena in Phoenix, Arizona. It was headlined by an epic heavyweight match-up. Francis Ngannou welcomed back former UFC heavyweight champion Cain Velasquez to the Octagon. This was the Mexican star’s first fight in over two years. In his absence, Ngannou has struck fear into the heart of the heavyweight division with his ridiculous knockout power. Also on the main card was a thrilling lightweight match-up between Paul Felder and James Vick. Head kicks from Velasquez to open up the round. Ngannou unleashes a flurry of strikes and Velasquez crumbles over. The fight is over. Velasquez is fine, his knee gave out. He’s not happy. Right hand from Felder just lands. Felder with another hard shot and Vick follows up with a right hand and jab. Spinning elbow just lands for Felder, who follows up with a leg kick. Another right-hand lands for Vick. Felder comes inside and lands a nice right hand. Felder clinches up with Vick against the cage, but they separate quickly. Body kick lands for Vick and Felder blitzes in and catches him to end the round. Both men are going at it inside the pocket and land some shots. Felder goes in on a shot and Vick tries for a guillotine but is unsuccessful. They clinch against the cage now. Big right-hand lands over the top for Felder. Vick clinches up with Felder against the cage now. Felder just misses on some big shots inside. Front kick to the body lands for Felder, and he follows up with a leg kick. The round comes to an end. A beautiful spinning back kick to the body lands for Vick. An inside elbow lands for Felder, but Vick backs him up with a combination. Vick is showing some damage from Felder’s leg kicks with a limp. Felder comes inside with a nice combination. Felder cracks Vick hard with a hook and he drops to a knee for a second. Both man now exchanging big shots inside before they clinch against the cage. Vick eats a spinning elbow as he jumps inside. Felder presses up against Vick on the cage. The fight comes to an end.